Bertie County is home to fertile farming land, as well as miles and miles of beautiful waterways. So, while we spend a great deal of time farming and hunting, our most enjoyable past time is fishing. From a farm pond to the waters of the Roanoke, Chowan, and Cashie Rivers, our local farmer friends know their fish. And, they know how to cook them: baked, broiled, stewed, or fried. But, never, ever raw! As Papa Jack said many times, "Raw fish is bait". So, the raw fish known as sushi has never found much of a following here in Bertie County. Still, we're willing to try almost any food once. And, while the raw fish and sea weed found in sushi don't do much to excite our tastes, the various dipping sauces do. 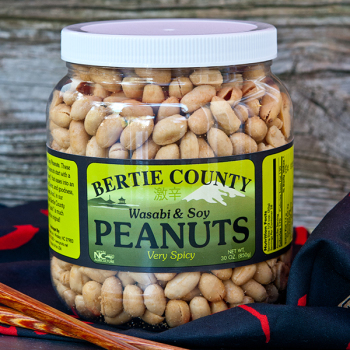 With that in mind we've spent the past year taste testing many of those sauces, and after a lot of recipe tweaking, we are pleased to announce our newest peanut flavor: Bertie County Wasabi and Soy Peanuts. These blister fried peanuts start with a Wasabi-generated "bang" that eases into an earthy soy flavor, and goodness, they are tasty. And, in our opinion, this Bertie County version of "sushi" is much better than the original! Owner Response:Thanks for your thoughts. We'll take them under consideration as we move forward. 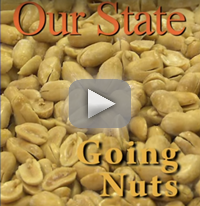 If you like the taste of wasabi and a faint taste of soy then these peanuts are an excellent choice !!! Fresh, spicy and unusual. I would buy them again. A very unique flavor. These are absolutely great. I usually think wasabi snacks are too hot to enjoy but these nuts have solved that issue. These are perfectly seasoned to enjoy the flavor without squinching my face! Plus I love the earthy soy taste that follows. Brilliant y'all! If you like an Asian influence, you will like these. Best peanuts on the market. Nice and crunchy and very flavorful! Received these peanuts as a gift. Will now be a loyal customer!!! I received a jar as a gift and liked them enough to order three jars. 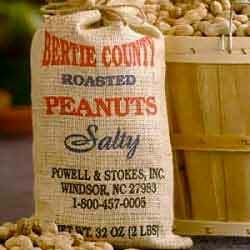 The whole line of Bertie County peanuts are the best I've ever had. Very tasty, fresh, and crisp. We were given Bertie County Peanuts as a gift and have continued to purchase them on our own because they are so delicious! The peanuts are huge and expertly roasted. We particularly like the wasabi and soy flavored peanuts...not too spicy, just right! A great company that provides wonderful gift baskets and delicious treats. Highly recommended. I purchased these on a trip to Virginia. Liked them so much I went on line and ordered more. They have a nice kick. These were bought for a friend who loves spicy foods. They were a perfect match for his taste. He loved them. I like the wasabi & soy flavor-it has a little bit of horseradish bite, but not so much that it covers up the peanut flavor. They're also very crunchy, which I was hoping for! We love all the products we get from Bertie!